FX-SPORT Headphones: Interval Bike Sprints. 5 mins warm up then 13 x 1 min sprint with 75 sec recovery, then 2 min sprint at the end. FX-SPORT Headphones: Interval Bike Sprints. 5 mins warm up then 12 x 1 min sprint with 75 sec recovery. FX-SPORT Headphones: Interval Bike Sprints. 5 mins warm up then 10 x 1 min sprint with 75 sec recovery. FX-SPORT Headphones: Intervals on Bike. 76 mins total with 10 min warm up and 5 min cool down. 2 sets of 8, 6, 4, and 2 min hard. FX-SPORT Headphones: Interval Bike Sprints. 45 mins total. 30 second bursts of speed at 130-140 revs with 1 min rest. Also some steady speed. FX-SPORT Headphones: Interval Bike Sprints. 5 mins warm up then 13 x 1 min sprint with 1 min recovery, then 2 min sprint at the end. FX-SPORT Headphones: Interval Bike Sprints. 5 mins warm up then 12 x 1 min sprint with 1 min recovery. FX-SPORT Headphones: Interval Bike Sprints. 5 mins warm up then 10 x 1 min sprint with 1 min recovery. FX-SPORT Headphones: Intervals on Bike. 32 mins total. 5 min warm up then 1 set of 5, 4, 3, 2, and 1 min efforts with half those times for recovery. FX-SPORT Headphones: Intervals on Bike. 57 mins total. 5 min warm up then 2 sets of 5, 4, 3, 2, and 1 min efforts with half those times for recovery. 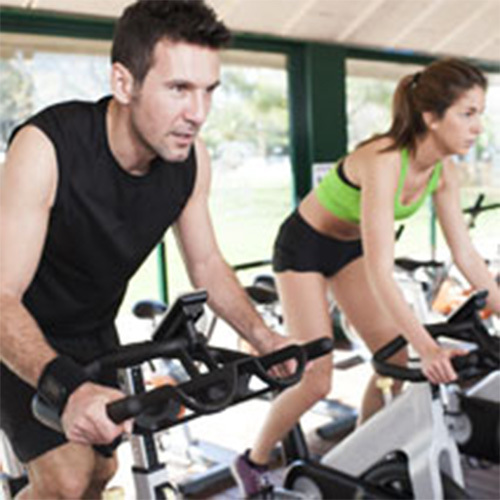 FX-SPORT Headphones: 30 minute intermediate exercise bike session with 10 min warm up and 5 min cool down.